Tomatoes are an excellent source of vitamins A and C which help improve your visionand can also help prevent night blindness. A recent study shows that the high vitamin A content of tomatoes can help prevent macular degeneration, a serious eye disease. Moreover, tomatoes can lower your risk of developing cataracts. Tomatoes are also packed with the phytochemical antioxidants lycopene, lutein and zeaxanthin, which protect your eyes from light damage. According to a study published in the Journal of the National Cancer Institute, consuming more tomatoes can help combat prostate cancer. Tomatoes can also help reduce the risk of some other cancers such as stomach, lung, cervical, pharynx, mouth, throat, rectal, colon, esophagus, and ovarian cancer. That’s because tomatoes are high in the antioxidant lycopene. If you want to boost the anti-cancer benefits of tomatoes, try cooking them with olive oil. Eating tomatoes regularly can help clear your skin and make it look perfect. Tomatoes contain lycopene, a powerful antioxidant that protects skin from sun damage and makes your skin less sensitive to UV light, one of the causes of wrinkles and fine lines. You can use tomatoes to heal acne and rashes and minimize large pores. 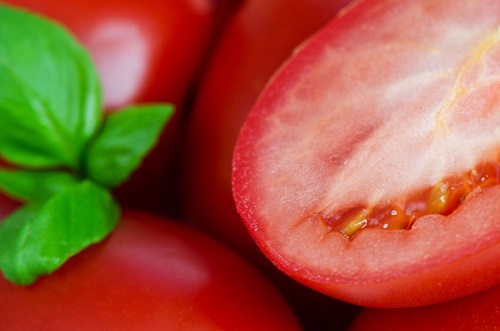 Rub the pulp of tomatoes on your dull skin to restore its healthy glow. Tomatoes contain very little carbohydrates and they help reduce blood sugar levels. Tomatoes also contain chromium that helps control blood sugar, and fiber that helps keep the blood sugar levels from getting too high. A few studies have found that the powerful antioxidants in tomatoes protect the bloodstream and kidneys, the areas which are often affected by diabetes. Tomatoes are a great source of lycopene and vitamin C that can help you sleep better. So, if you have trouble falling asleep, consider adding tomatoes to your daily diet. You can use tomatoes in your soup or salad, or add one to your smoothie. Tomatoes contain vitamin K and calcium which help keep your bones healthy. Therefore, eating tomatoes can help strengthen and repair your bones. It has been shown that the antioxidant lycopene can also improve bone mass and help fight osteoporosis, a serious disease that can cause bone fractures, deformity, and disability. Due to the presence of anti-inflammatory agents such as carotenoids and bioflavonoids, tomatoes can relieve chronic pain. People who frequently suffer from mild or moderate pain usually have inflammation. A research show that drinking a glass of tomato juice every day can lower blood levels of TNF-alpha that causes inflammation, by about 34 percent. Thus, tomatoes are good for people who suffer from chronic health issues such as heart disease, osteoporosis, cancer and Alzheimer’s. Tomatoes are also good for your hair. They are packed with vitamins and iron that help strengthen your hair and can even add shine to damaged and lifeless hair. Moreover, tomatoes have the acidity that balances the pH levels in the hair. If you have a dandruff and itchy scalp, apply fresh tomato juice on your hair and scalp after shampooing, and rinse with cold or lukewarm water after 4 to 5 minutes. Don’t use tomatoes on your hair too often because their acidity can dry out your hair. If you are trying to drop those unwanted pounds, make sure you include tomatoes into your everyday diet. They are low in fat and don’t contain cholesterol. Tomatoes contain plenty of fiber and water, so they will help you feel full without an unnecessary amount of calories. You can eat tomatoes raw or add them to your casseroles, salads, and other diet-friendly meals. Whether fresh, sun-dried, stewed, pureed or juiced, consider adding more tomatoes to your everyday diet and reap all their health benefits. Do you love tomatoes? Did you know about their health benefits?